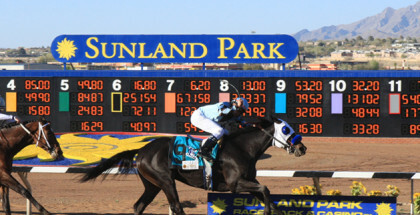 Awesome Baby wins Big with Record Attendance at the 2014 Sunland Park Oaks: Awesome Baby took home the win at the 2014 Sunland Park Oaks race at Sunland Park on Sunday, March 23, 2014. Awesome Baby ran the 1 1/16 mile fast dirt race and took home the $200,000 purse along with 50 points towards the Kentucky Oaks, giving Awesome Baby a total of 110 points. 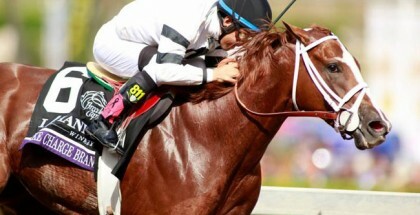 Awesome Baby (shown above winning the Santa Ysabel Stakes) and jockey Mike Smith won the 2014 Sunland Park Oaks for trainer Bob Baffert on Sunday, March 23, 2014. Awesome Baby was the pace setter with jockey Mike Smith leading her to the front of the pack and the win in the 2014 Sunland Park Oaks. Awesome Baby the 1-2 favorite coming into the race was unyielding despite challenges from opponents Empress of Midway and Lucky for You, and Awesome Baby ended up posting a time of 1:43 4/5. Empress of Midway and Lucky for You finished in a tie for second place with D’ya Knowwhatimean and George’s Peach following behind to round out third and fourth place. 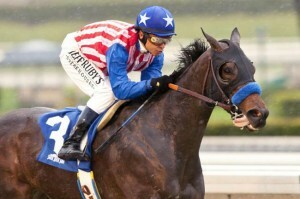 Trained by Bob Baffert, Awesome Baby has won her last three starts and looks promising in the future. 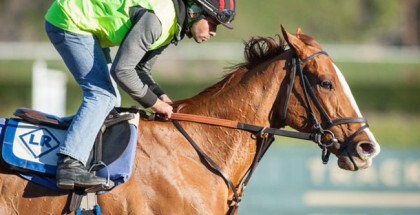 Awesome Baby and Mike Smith received a warm welcome and lots of praise at this race as Smith had major supporters out there rooting for him and there was even a record breaking attendance. 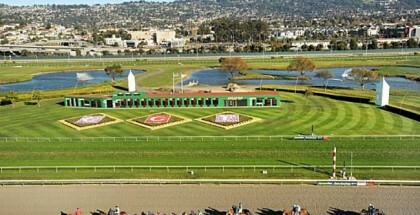 Hopefully the Oaks will prove to be just as exciting for Awesome Baby.